Ziemba found that "[t]here was a strong association between travel route change and mode substitution, where the likelihood of switching to cycling was 11 times higher for those who did not use the street before 2012." 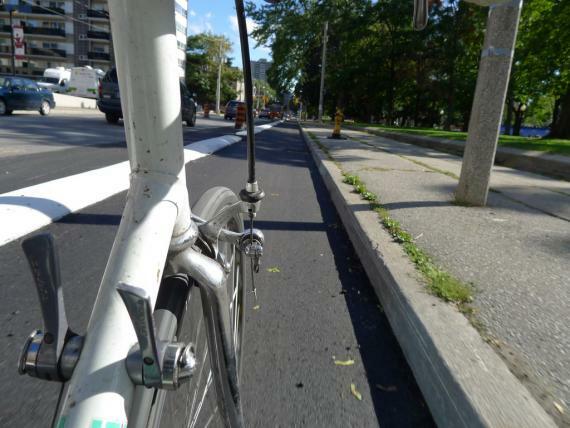 That is, the transformation of Sherbourne Street cycling facilities from painted bike lanes to physically separated bike lanes with curbs on the north end and raised to near sidewalk level on the south end. This is not surprising given the almost 300% increase in cyclists on Sherbourne. 38% current cyclists on Sherbourne did not cycle before 2012 for the same or similar trip. Most (55%) new cyclists would use transit before, while fewer (24%) potentially switched from driving. Might be good in a downtown context where transit congestion is a big issue. Most mentioned safety as the reason why they shifted. Savings in travel time scored almost as high as improved safety as a reason for cycling. That is, under favourable conditions, cycling can actually save time for many. Even though there were fewer cyclists who switched from driving than switched from transit, it's still a substantial percentage and has a greater impact on congestion given the large space a car takes up to carry 1-2 people around. I really appreciate that people are studying this since it'll really help with further campaigns. If a future masters student is looking for a topic, I would suggest replicating this for Richmond and Adelaide where my friends and I have suspected that not only have a large number of people switched from Queen or King but that it has opened up the core to many new cyclists as well. This is encouraging, though the missing control group here is "percentage of people on any street who have recently switched to biking." There's a constant churn of people starting and dropping bike trips; the question is whether the churn into biking is faster than the churn out. That said, 38% seems like a lot. That's a good point Michael. That's a good point Michael. We are fairly certain that there's a solid long-term increase in new people cycling or cycling for more trips in Toronto. Every few years with census and other surveys they point to increases. But I don't think any of them would have such a large growth rate of 38%. I've also have heard from a few people that Sherbourne (and Richmond/Adelaide) got them cycling for the first time or again. So I don't think it's too risky to say that the protected bike lanes have had a substantial positive effect on getting new people cycling. Excellent point Michael, the research was a case study and as result we were not able to control for a general cycling culture developing in Toronto. Thus, some increase in cycling could be expected due to changes in attitudes. This was further discussed in the limitations of the report, however to control for this, I believe the best approach would be to conduct the same survey on a comparable street without cycle tracks. Certainly an area for future research.